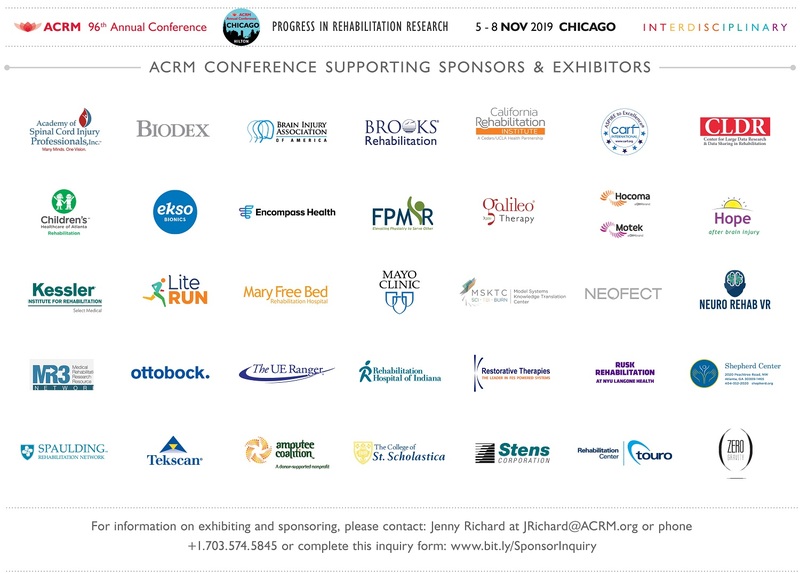 As a member of this group, enjoy a unique opportunity to network with clinicians, researchers, rehabilitation and consumer technology industry members, and end-users who are interested in the field of rehabilitation technology. 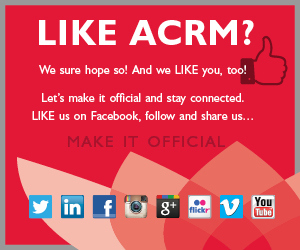 You are not required to be a member of ACRM in order to participate in this group. If you are interested in joining this exciting and active networking group or would like more information, please contact the group’s chairs, Megan Mitchell and John Morris. Contestants pitch their original rehabilitation technology business or solution to a panel of rehab industry experts and an audience of clinicians, researchers, engineers, and decision-makers to receive feedback and win prizes. 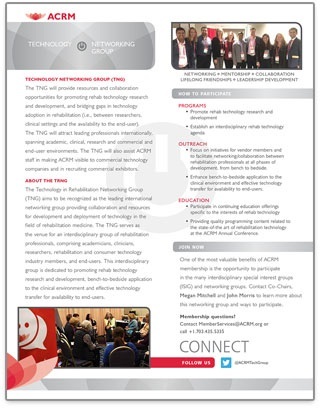 The Technology in Rehabilitation Networking Group (TRNG) aims to be recognized as the leading international networking group providing collaboration and resources for development and deployment of technology in the field of rehabilitation medicine. The TRNG serves as the venue for an inter-disciplinary group of rehabilitation professionals, comprising academicians, clinicians, researchers, rehabilitation and consumer technology industry members, and end-users. This inter-disciplinary group is dedicated to promoting rehab technology research and development, bench-to-bedside application to the clinical environment and effective technology transfer for availability to end-users. 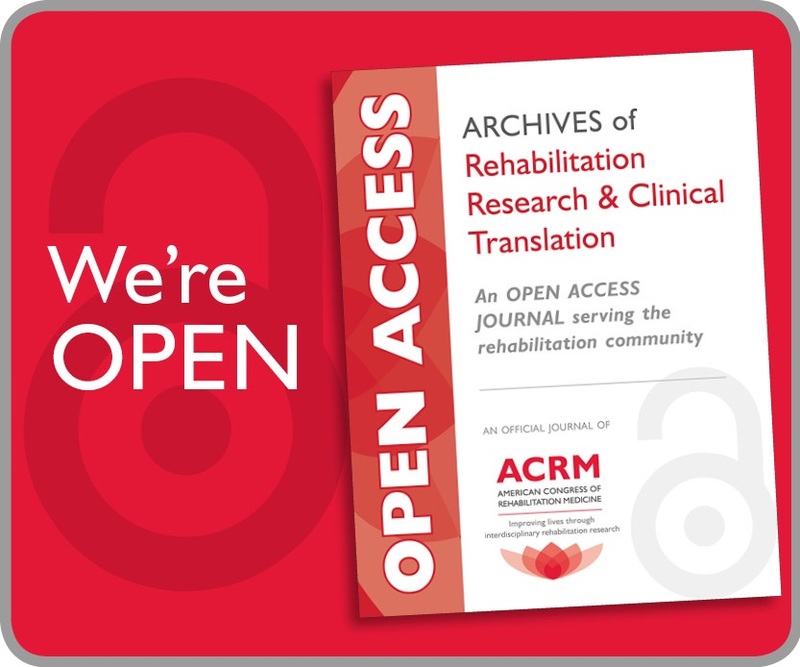 The TRNG will provide resources and collaboration opportunities for promoting rehab technology research and development, and bridging gaps in technology adoption in rehabilitation (i.e., between researchers, clinical settings and the availability to the end-user). The TRNG will attract leading professionals internationally, spanning academic, clinical, research and commercial and end-user environments. The TRNG will also assist ACRM staff in making ACRM visible to commercial technology companies and in recruiting commercial exhibitors. 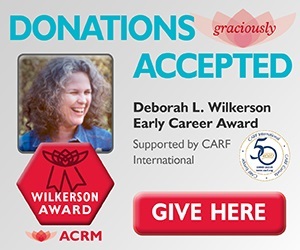 One of the most valuable benefits of ACRM membership is the opportunity to participate in the many interdisciplinary special interest groups (ISIG) and networking groups. Click the JOIN NOW button to learn more or contact Member Services at +1.703.435.5335 for personal assistance. The Programming Task Force is dedicated to providing the membership with quality programming content related to the state-of-the art in the field of rehabilitation technology at the ACRM Annual Conference. The Programming Task Force assists in recruiting content from the top researchers in the field and within ACRM. Task force members also assist in organizing the LaunchPad competition. The Industry Outreach Task Force is dedicated to serving as a two-way channel to make connections and exchange ideas between researchers, engineers and clinicians, and vendors in the rehabilitation technology industry. The task force focuses on initiatives for vendor members and to facilitate networking/collaboration between rehabilitation professionals at all phases of development, from bench to bedside. 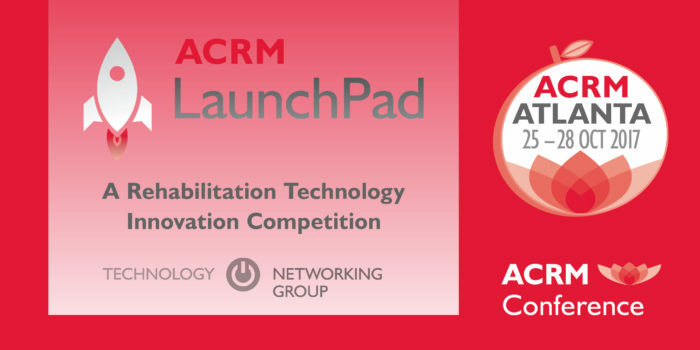 The focus of the LaunchPad Task Force is to connect researchers, clinicians and technology start-up companies, support the growth of ACRM membership in the technology rehab space and expose the current membership to reviewed cutting edge rehab technologies by developing and executing a rehab technology competition at the annual conference. 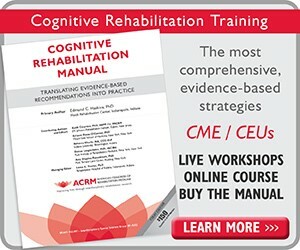 The Clinical Managers in Rehabilitation Technology Task Force aims to connect, support and provide resources to rehabilitation clinicians employed by technology companies and by clinical practice organizations that use rehabilitation technology. The group will gather, disseminate and share best practices as they relate to the intersection of the private industry, clinical practice, use of rehabilitation technology, technology development and validation, and regulatory compliance. We will provide a space within ACRM for dialogue and collaboration among clinicians, researchers, engineers and product developers to benefit the end user. EVERYONE IS WELCOME! 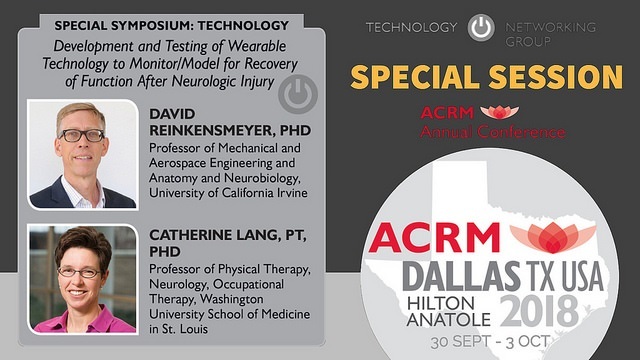 Save the date and plan to attend the TNG Clinical Managers in Rehabilitation Task Force meeting at the ACRM 2018 Conference in Dallas. It’s a great opportunity to network with rehab colleagues who share your interests, meet your next mentor, collaborator, employer, or funder and learn how to participate in the Technology Networking Group. 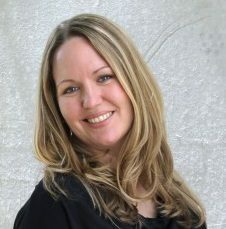 Lauren Sheehan is a Clinical Manager for Neofect, Inc., developer of smart rehabilitation solutions to help patients with neurological and musculoskeletal injuries by providing patient-customized training exercises using games. Her clinical specialties include: vision rehabilitation, wheelchair seating and positioning, driving rehabilitation and outpatient neuro rehabilitation. Lauren is passionate about mentoring and teaching, building teams and continually learning and growing professionally. Sherri Wallis a Clinical Specialist with Rex Bionics, maker of REX Bionic Exoskeleton, a self-supporting and self-balancing robotic device that allows people with severe mobility impairments to walk independently. Sherri is a US-based physical therapist with twenty-seven years of experience in a variety of roles including clinical education, management, and treatment in various settings including acute care, home health, acute rehabilitation, and long-term skilled nursing care with a diverse patient population and diverse managerial supervision from supervision of staff in a hospital setting to international, multi-site, clinical supervision.